Steven has a Diploma in Property, Certificate IV in Property and is a Licensed Agent in both ACT and NSW. He is also a qualified Auctioneer. 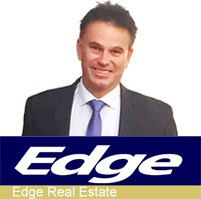 Steven has been involved in sales for over 15 years and has been Principal of Edge Real Estate for the last 8 years. Steven has advanced communication skills as he previously worked as a family counsellor and mediator. Steven is a skilled strategic thinker and planner of every sale he makes. Steven has been a guest speaker at the University of Canberra, and spoke on digital strategy for business for the ACT Chamber of Commerce and Industry at the National Press Club. Steven previously took a company he formed to a public listing on the ASX two years from formation. Steven has supported many charities including being the auctioneer for the St Vincent De Paul Charity Ball raising $25,000 on the night for the Charity, Autism and Asperger Ball and the Red Cross Ball. Steven is a highly experienced, qualified and most importantly, a consistent performer.